Carbon Poker recently released their Poker Odds Calculator, a poker analysis tool designed to help players improve their game by offering in-game statistics and notes on opponents, as well as comprehensive post-session analysis. 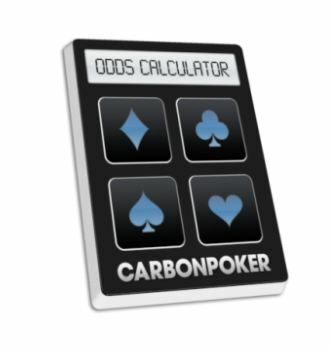 If you’re in the market for a piece of free poker tracking software that can really raise your game to the next level, then you will definitely be interested in the Carbon Poker Odds Calculator. The Carbon Poker Odds Calculator is more than just an odds calculator. While it does offer real time statistics that will help you to make the correct play, it goes further than that, providing tracking tools that allow you to build a comprehensive database of information about your opponents, as well as helping you to review your game with a hand replayer. This versatile poker software can be used on Fixed Limit and Pot Limit Hold’em games as well as No Limit, and the cutting edge technology allows it to perform a variety of calculations and have them displayed in a manageable, easy to apply fashion – in next to no time. Use the information provided by the Poker Odds Calculator correctly and you will quickly raise your game to new heights. To get started with this handy piece of poker software, simply log in to your Carbon Poker player admin section and choose “Poker Odds Calculator” from the navigation bar on the left. The download will be complete in a matter of seconds, providing you with access to masses of useful statistics that will help to raise your poker game to the next level. If you aren’t yet registered with Carbon Poker, it is definitely worth doing so to check out this fantastic tool. It may just change the way you play poker forever and as if that weren’t enough, Carbon offer all new players an impressive welcome bonus of up to $600, plus a daily cashback offer of up to 45%!